Emily Shaw graduated from the University of Illinois Urbana-Champaign and received a B.A. in Spanish. After completing her undergraduate studies, Emily moved to Chicago and after a variety of jobs settled into a career in insurance. 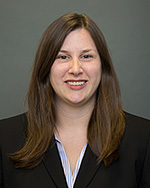 Emily is a Senior Claims Examiner for Markel Service Incorporated handling primarily Employment Practices, Directors & Officers, and Fiduciary claims. Previously, Emily worked as a Claims Specialist for Founders Insurance Company in Des Plaines, Illinois. Emily attends Chicago-Kent as an evening division student and is a member of Law Review.